The Humayun’s Tomb or Maqbara of Humayun is one of the most important tourist attractions and places of interest on Delhi sightseeing tour. It is the historical tomb monument of the Mughal Emperor Humayun’s in Delhi, India. This magnificent historical tomb memorial monument was commissioned by Humayun’s first wife and chief consort, Empress Bega Begum, also known as Haji Begum in 1569-70. She chose Mirak Ghiyas, a Persian architect, to design the architecture of the tomb monument. The Humayun’s Tomb was the first garden-tomb on the Indian subcontinent and is located close to Old Fort (Purana Quila) that Emperor Humayun founded in 1533. The tomb is placed in center of a 30 acre Char Bagh, a Persian style beautiful garden. This tomb was also the first structure to use red sandstone at such a large scale. The historical Humayun’s Tomb complex was declared as a UNESCO World Heritage Site in 1993. The complex is dotted with several other smaller monuments of historical importance. The main tomb of Emperor Humayun within the complex also houses the graves of Bega Begum herself, Hamida Begum and Dara Shikoh, the grandson of Humayun and son of the Emperor Shah Jahan, known for constructing world-famous Taj Mahal in Agra. There are also several other graves and tombs of succeeding Mughals within the complex including Jahandar Shah, Farrukhsiyar, Rafi Ul-Darjat, Rafi Ud-Daulat, Muhammad Kam Bakhsh and Alamgir II. Exploring the Humayun’s Tomb in Delhi will provide you a great opportunity to explore the brilliant Mughal architecture. Char Bagh: The Char Bagh is a beautiful Persian style garden with quadrilateral layout spread in an area of 30 acre. It is the place on which the main tomb of Emperor Humayun is placed on. Exploring the garden will provide you a great experience to cherish for the lifetime. Tomb and Mosque of Isa Khan: The tomb and mosque of Isa Khan is one of several monuments that dot the pathway leading up to the Humayun’s Tomb. It is an octagonal tomb which is placed within an octagonal garden. 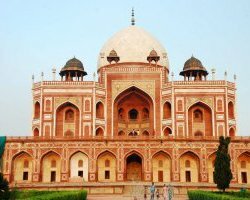 Afsarwala Tomb and Mosque: One of key attractions within Humayun’s Tomb complex is Afsarwala Tomb (Officer’s Tomb) belonging to a nobleman officer in Akbar’s court. The Afsarwala Tomb lies on the southwest end of the complex. Marble graves inside the tomb are attractions to see which dated 1666-67 CE. Adjacent to the tomb there is a mosque called Afsarwala Mosque that dated to the same period. Bu Halima's Tomb and Garden: When you will enter the complex, you will first enter a garden complex, called as Bu Halima’s Garden. The tomb is positioned at the raised platform and is not at the center. It seems that it is a later addition. Arab Sarai: Arab Sarai literally means the sarai (rest house) for the horses. This beautiful structure is located adjacent to the Afsarwala Mosque. It was constructed by Empress Bega Begum, Emperor Humayun’s first wife and chief consort, around 1560-1561 CE. It was apparently constructed for the craftsmen who came for the construction work of the Arab Sarai. It could accommodate approx. 300 Arabas. Arab is a Persian word which means Cart or Gari or Vehicle. Nila Gumbad: Nila Gumbad (previously known as Nila Burj) or Blue Dome is a tomb that stands outside the boundary of the Humayun’s Tomb complex. It will amaze you with striking blue glazed tiles. This is why it is named Nila Gumbad or Blue Dome. This beautiful historical Blue Dome was constructed by Abdul Rahim Khan-I-Khana, the son of Bairam Khan also a courtier in Mughal Emperor, Akbar's court, for his servant Miyan Fahim. He built this memorial because Fahim was the friend of his son and died alongside one of his own sons. The dome is very popular among visitors because of its stunning and unique architecture. When you will come to see this Gumbad you will see beautiful ceilings decorated with painted and incised plaster. Barber’s Tomb: Also called Nai Ka Gumbad, the Barber’s Tomb is located towards the southeast corner, within the Char Bagh Garden. The tomb belongs to royal barber and it dates backs to 1590-91 CE. You can see inscription found inside about period of construction.